How eating right can reduce pain and increase the benefits of prolotherapy. After treating joint or muscle pain with prolotherapy, doctors stress the importance of moderate exercise in proper healing, but did you know that your diet can have an impact on the efficacy of prolotherapy as well? Experts say that eating well can help treat chronic pain and recommend an anti-inflammatory diet for maximizing the benefit of any prolotherapy treatment. Talk to Dr. Kerendian about how the foods you eat can affect chronic pain and try these tips for a pain-free diet. Balance your pH. Highly acidic diets can contribute to inflammation and the pain that comes with it. To help regulate your body’s pH levels, doctors recommend drinking a lot of water and eating a diet rich in vegetables and protein. Eating too many carbohydrates and sugar can contribute to high levels of acidity in the body, so be sure to limit your intake of these foods to keep inflammation under control. 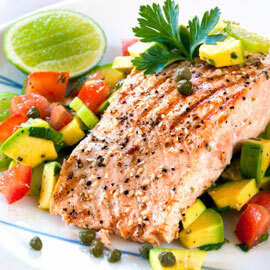 Eat omega-3 rich foods. Omega-3 fatty acids have been found to reduce inflammation and contribute to a number of other health benefits like the reduction of bad cholesterol. The best sources for omega-3s are typically fish, seeds and nuts, avocado and olive oil, but you can also take nutritional supplements like flaxseed or fish oil to easily add some omega-3s to your diet. Avoid omega-6 rich foods. Foods that contain another kind of fatty acid, omega-6, actually have a tendency to increase inflammation and contribute to chronic joint pain. Commonly found in salad dressings, vegetable oils, mayo, cured meats, margarine and animal fat, reducing your consumption of omega-6s can help to eliminate chronic pain. Eat more antioxidants. Antioxidants combat molecules in your body known as free radicals that come from smoke and pollutant inhalation and eating processed or genetically modified food. Free radicals contribute to the body’s degenerative processes, including aging and long-term disease, making the reduction of their influence key in reducing chronic pain. To get more antioxidants in your diet, eat berries, green leafy vegetables, seeds, nuts and fruits like the pomegranate. Eat less refined foods. In addition to having high levels of sugar, processed foods like soda and prepackaged baked goods can have a negative impact on immune function, which is critical in repairing damage to your body’s tissues. Avoid highly-processed and refined foods to avoid their low nutritional value and ensure proper healing and immune function.